It is a well-known fact that airline stocks are inversely related to oil prices. This is because expenses on fuel represent one of the most significant input costs for an airline company. Much to the anguish of airlines, oil prices have been on the rise, up more than 20% so far this year. Apart from the geopolitical tensions in the Middle East, the economic crisis in Venezuela — a major oil exporter and OPEC’s recent plans of a lower-than-expected output raise have backed the rally in oil prices. Generally, the rise in oil prices induces significant increase in operating expenses of carriers and limits bottom-line growth. According to the recent commentary by Ed Bastian, CEO of Delta Air Lines, Inc. DAL, the carrier is likely to incur additional costs to the tune of $2 billion in 2018 due to increase in oil prices. In fact, it is not only Delta but the entire airline space that is likely to suffer due to rise in fuel costs. This is quite evident from the International Air Transport Association’s (“IATA”) bearish forecast for current-year airlines’ profitability. According to the research firm, global net profit for the industry is expected to be $33.8 billion, much lower than the 2018 profitability forecast of $38.4 billion, unveiled in December 2017. In April, another airline heavyweight — American Airlines Group Inc. AAL — had trimmed its current-year earnings per share projection due to high fuel costs. Rise in fuel costs is likely to dent Delta’s profitability in the second quarter as well. This Atlanta, GA-based Zacks Rank #4 (Sell) carrier had slashed its second-quarter earnings per share guidance earlier this month, due to rising fuel costs. The metric is now likely to be in the range of $1.65-$1.75, much lower than the previous estimate between $1.80 and $2. In fact, high fuel costs have contributed to the 11% year to date decline in the Delta stock price. 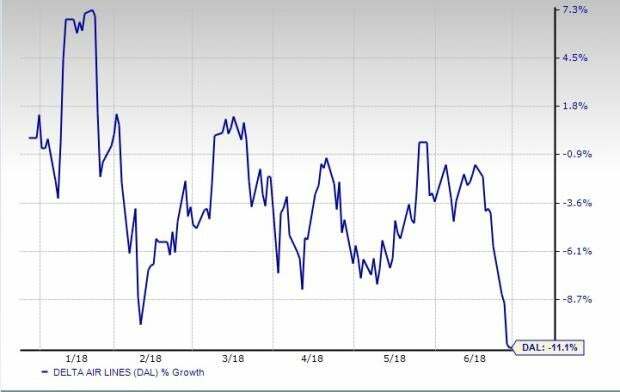 Apart from Delta, other carriers like Southwest Airlines Co. LUV and JetBlue Airways Corporation JBLU are likely to witness bottom-line decline, respectively, due to upsurge in oil prices. Also, JetBlue and Southwest’s unfavorable Zacks Ranks can be primarily attributed to increase in oil prices. However, you can see the complete list of today’s Zacks #1 Rank (Strong Buy) stocks here.